I stopped the addiction of collecting action figures and statues long ago, but I did hang onto what I had collected during the past 20 years. Here’s my small shrine at home. Some of my co-workers recently gifted me with a Hallmark Thor Keepsake Ornament and a Captain America Keepsake. On the latter, Cap is busting out of Avengers #4. The ornament opens up to an actual comic book, mini-sized, with the Jack Kirby artwork inside. A great gift. Nuff Said! that's really cool. I love all the DC stuff, especially the Metal Men. & the missus bought me the two Vault books. the Marvel one's great. 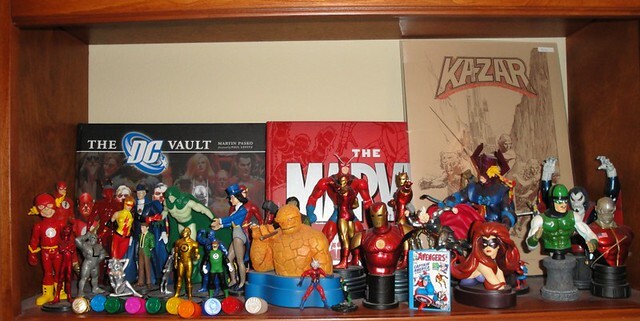 What a fun eclectic collection of mementos.....if you felt like taking a look, heres my collection of classic Marvel characters so far............love the site Richard, I always enjoy your posts! Dusty, your statue collection is Marvelous, no pun intended! I love it. You have a number of Bowen statues I always wanted. Love the Silver Surfer. That is cool. I envy your Spectre action figure. I can't find that one on toy stores.